Are you looking for a simple tutorial to install WordPress site on Bluehost in under 5 minutes? Well, your search ends here. If you are wondering why should one start a blog, here are 2 biggest reasons. But here’s the sad thing. Setting up a blog is a BIG deal for most people and that’s the reason why they NEVER start their own blogs. 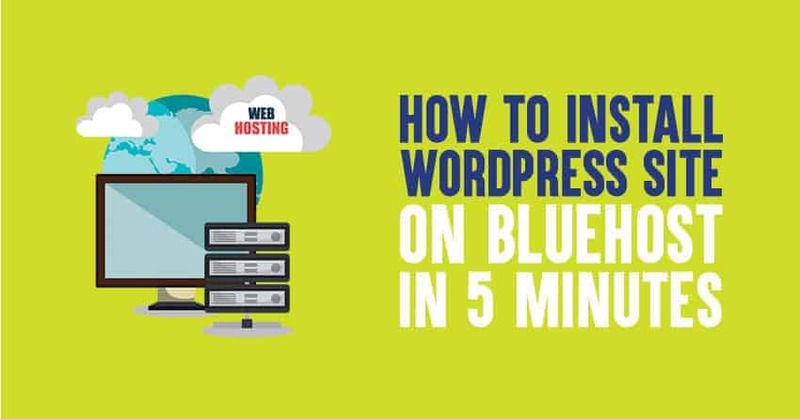 If you are one among them, this short tutorial is for you where I’m going to walk you through how to install WordPress on Bluehost in under 5 minutes. Please note that, all the links mentioned in this page are affiliate links. That means, I earn a small commission every time you purchase something from those links without costing you anything extra. It helps me create really valuable stuff for you in the future. Before diving into the details, you may ask, why should I use Bluehost? A valid question. Bluehost is the most reliable hosting service that you need to run your self-hosted WordPress site. A web hosting is MUST to run a blog. It’s just like renting a property where you have to pay others to run your site. Now, let’s discuss briefly what Bluehost offers you. And many more that make your WordPress sites powerful. Now… let me walk you through how you can easily set up your first WordPress blog on Bluehost within minutes. Once you click on this special link, you will be taken to Bluehost’s home page where you need to simply click on the “Get Started Now” button to continue. Now, enter any domain name that you want. Make it simple, easy to type and remember. If you are struggling to come up with a great domain name, refer this informative article. I highly recommend you to pick 36 months package as you can get Bluehost starter pack for just $3.49 per month (including the free domain). Always use numbers, capital letters and special characters (like $,@,* etc) while creating a password. Once you set your password and login to the Bluehost control panel, you will see “WordPress” option under “Site Builders” tab. Click on it to install WordPress on Bluehost. You are done! You have now successfully installed WordPress on Bluehost. Now, all you need is to create a site name for your WordPress site and enter your login details to login to your website. Note: You will receive an email from Bluehost with all the necessary details on how to proceed further after you buy hosting from them. So that’s it. See how simple it is? Just in case if you want to get installed by someone who’s an expert, let me do it for you for FREE. You just have to buy Bluehost hosting using any one of my links (so I can earn a small commission without costing you anything extra). Installing your first WordPress blog on Bluehost is REALLY easy if you follow the simple step by step tutorial given in this short tutorial. Without a doubt, WordPress is the most popular content management system that is used by millions of people worldwide to launch their blogs. Although Blogger, Typepad offers free services but they don’t come any closer to WordPress self publishing platform. It gives you full control over your sites and you can monetize your content without having to share your profits with others unlike Blogger platform. So what are you waiting for? Use this simple tutorial to launch your first WordPress blog on Bluehost. Please let me know if you have any more questions and bookmark this page for future reference.